A new chuteside blood test may help producers and feeders determine whether antibiotic treatment is needed on an individual animal. Imagine a tool that could quickly and accurately diagnose illness in cattle almost before they knew they were sick. A North Carolina-based company, Advanced Animal Diagnostics has come up with a technology that could do just that. "As a beef producer myself, I see the need to increase profitability and protect access to tools like antibiotics by demonstrating we use them precisely only on animals that truly need them. We designed QScout BLD to do both," Joy Parr Drach, AAD president and CEO, said in a recent press release unveiling the new technology. Still in testing phases, the QScout BLD test is designed to work with just a drop or two of blood. Blood is collected using a patent pending blood collection and transfer device, transferred to a single-use test slide, and inserted into the chute-side "lab-in-a-box" QScout Cattle Lab. In as little as 40 seconds, the QScout Cattle Lab is able to decipher the calf's immune response, identifying and differentiating white blood cells. White blood cells are the first responders to infection and aid users in determining if antibiotic intervention is needed. Readings are then automatically uploaded to AAD's QStats online database. The database allows users to go back and look at analytics and performance of individual animals as well as entire lots of cattle. AAD has a similar technology already at work in the dairy industry. The QScout MLD test assesses milk leukocyte differentials in each quarter of the udder, revealing subclinical mastitis in the earliest stages of infection. According to the company's press release, results from a commercial feedlot study were recently released. 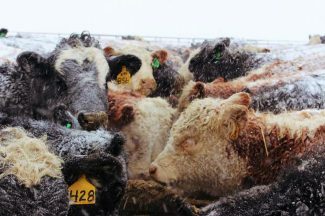 The trial studied medium risk, sale barn procured cattle placed in a Nebraska feed yard. Cattle fell into two groups. One group received mass treatment during the initial processing at the feed yard, and the other represented selective treatment based on the results of the test. The results revealed that the feed yard was able to decrease arrival antibiotic use by as much as 87 percent using the new test and selective treatment of animals when compared with metaphylaxis. The study also revealed no significant difference in the hot carcass weight or yield grade between cattle that received mass treatment and those selectively treated. While there has been some study of the use of the test in young calves at the ranch level, not much has been done in the feed yard hospital setting on cattle that have been identified and pulled by pen riders. With the QScout BLD still in testing, there are still some unknowns. Feeders are showing interest in the idea, though. "Personally, I am all for another tool to help us more judiciously use antibiotics. That is provided the tool is efficient, cost effective and safe for our cattle and people," said Nicole Dean, manager at Coulter Ranch, Redington, Neb. In recent years, consumers have become more interested in where their food is coming from and how it is raised. The growing concern surrounding antibiotic use has resulted in new federal regulations geared toward antibiotic use in livestock, such as the new Veterinary Feed Directive regulation. Effective Jan. 1, 2017, the regulation requires producers to obtain a VFD (similar to a prescription) for all antibiotics important in human health administered in feed. The regulation also requires a veterinary prescription for all medically important antibiotics used in water. In addition these must come from a veterinarian with whom the producer has a working relationship. Dean said that in the Coulter Ranch feedyard, mass testing for sickness is not likely to happen on a regular basis.